It is highly recommended to use a quality rug pad with your area rug. Rugs can shift and rub against your floor, creating wear on the floor over time. A rug pad is a layer of protection between the rug and floor, preventing the friction against your flooring surface and the back of the rug. Helps you preserve the floor and get the maxmium life of your rug. We use a natural rubber on our non-slip backing, excellent grip and durability, safe to use with harwood floors as well as laminate, stone, tile and others. GripSoft is dense pad measuring 1/4" thick, enough to provide moderate cushion without becoming a tripping hazard. 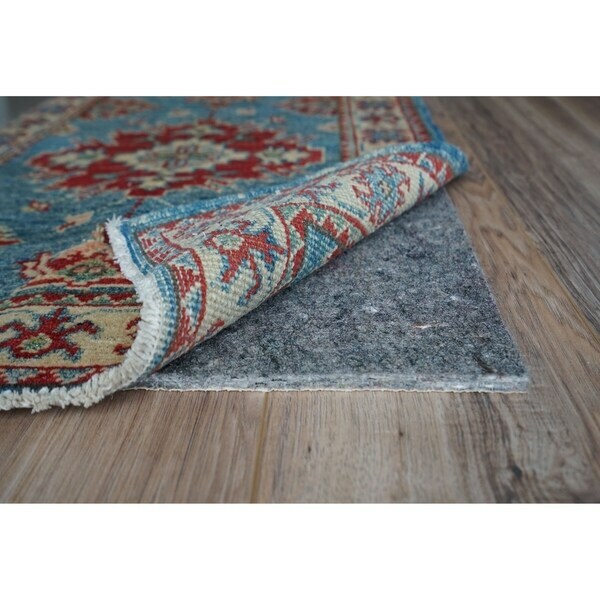 This rug pad is eco-friendly and contains no glues, bonding agents, adhesives, or unpleasant odors. Option: Non-Slip - 6' x 7'10"
This is a nice felt pad, it has a rubber backing so it does not slide on the floor. It is a nice thickness to give some nice cushion. It was easy to trim with scissors to fit my non-standard size rug. I have ordered a lot of felt rug pads from Overstock, this was my first GripSoft pad, I would definitely purchase this brand again. I love this pad! Natural rubber and felt and no smell. This pad will keep your rug in place. I used this pad under my bedroom rug, works great, provides good cushion underfoot and rug stays in place with rubber backing, no issues on my hardwood floors. love it and would buy same pad if I needed too again. Exactly what I needed for the large area rug in our living room. The felt adds just enough Cush and doesn’t slide on the tile. Also adds a layer of sound dampening that was needed to counteract the tile floors. Nice cushy padding. Rubber backing with felt top. Easy to unroll and cut to size. The pad is perfect, but I purchasd it one inch in diameter shorter than the rug. I should have purchased the pad in the actual rug size, because the pad already was made to be shorter than the rug. Now there it is about 2" shorter than the rug around the border. Bought this pad for a large rug on my three season screened porch. Area is not heated except by portable heaters in the winter. So far it has definitely kept my feet warmer on cool mornings with I don't have any extra heating. I wanted something with a rubber backing for the same reasons; it appears this pad will fit the bill very nicely. This is the best rug pad I’ve ever had. I looked up the best and this was it! Felt top and rubber backing is just what you need for ceramic tile! With the sales they have at overstock I can always find what I need and not only a better price but better quality at Home Depot. It was also nice to not pay shipping and nicer not to have to wrestle with this getting it in and out of my car. I bought several rugs with different types of non-slip rug pads. This pad is by far the best. It was more expensive than the others, but is also the only one that is padded. It was difficult to cut to size, but that is only because it was thick - which is what gives it the nice cushioning. My kids are enjoying laying on the floor to pay board games. It makes the whole room feel more comfortable and welcoming. My feet are happy, too! I bought a small floor rug to sit on while I do my makeup. When I opened the rug I honestly thought of retuning this rug pad before even trying it because the rug itself was so plush. HOWEVER, WITH this rug pad it’s like sitting on a cloud. It really makes such a huge difference! I highly recommend this brand of rug pads. Super sound absorbing, extremely comfortable, and definitely non-slip! Keeps my rug from slipping! Hard feat with a 3 year old running around. Best place to buy rug pads! Great quality that comes at a great price plus free shipping. Why buy a rug pad anywhere else? This is the same product that comes from high end stores. Nice cushy but lightweight rug pad. No odor when we opened it. Feels really nice underfoot and was really easy to trim to the size of our rug. Do yourself a favor and throw away all of those rubbery rug pads and buy these! They hold the carpet in place, no sliding at all and they make the rug more cushy. These pads, I bought a few, are easy to clean and keep my floors safe and my rugs in place. I have had to trim them when I've changed rugs, and I can do it fairly easily with sharp large home shears. These are great. Option: Non-Slip - 5' x 7'4" | Non-Slip - 9'9" x 11'9"
This is a high quality, plus rug pad that adds lots of comfort to my living room rug. I bought a size larger which was cheaper than the size I needed. I just used a pair of household scissors to cut it to fit. Keeps rug in place better than I expected for the low price! Very happy with this pad. Keeps rug from slipping on hardwood floor and also makes for comfortable walking on it. Makes the rug feel extra cushiony! This is perfect for under a runner especially in a "utility room" mudroom. Stops any rug from sliding all over and is super soft under your runner. Worth every single cent! What is there to say about a pad it works. I bought this padding for all my area rugs, it adds more cushion and I am sure will add to the life of the carpets. I only had to cut the circle one as the others were true to size. "Will the rubber backing damage or discolor vinyl plank flooring?" "Is the top of the pad rough gripper material to keep the rug in place?" There is a rougher fiber side and then a rubber checkered side. The rubber side will go down to the floor and the fiber side up to the back of the rug. I have this pad on ceramic tile so the rubber side is on the tile and the felt side toward the rug. Everything stays in place just fine. I would recommend. "What size pad do you need under an 8X10 foot rug and a 10X14 foot rug?" "What size pad is reasonable for an 8x11 rug"
"will this pad work on top of another rug?" "Will this rug pad work on top of a wall to wall carpet?" "Can this be used on heated tile floors"
Learn everything you need to know about rugs before you buy. We'll show you how to choose an area rug that's perfect for your home. You may rarely see your rug pad, but that doesn't mean it's not working hard to extend the life of your rug. Here's why a rug pad is important and what to look for when shopping. These natural fiber rugs are often hand-woven using hessian and other plant fibers, making beautiful organic home decor pieces. Read on for a few reasons to buy a jute rug and tips on purchasing the perfect rug for your home.